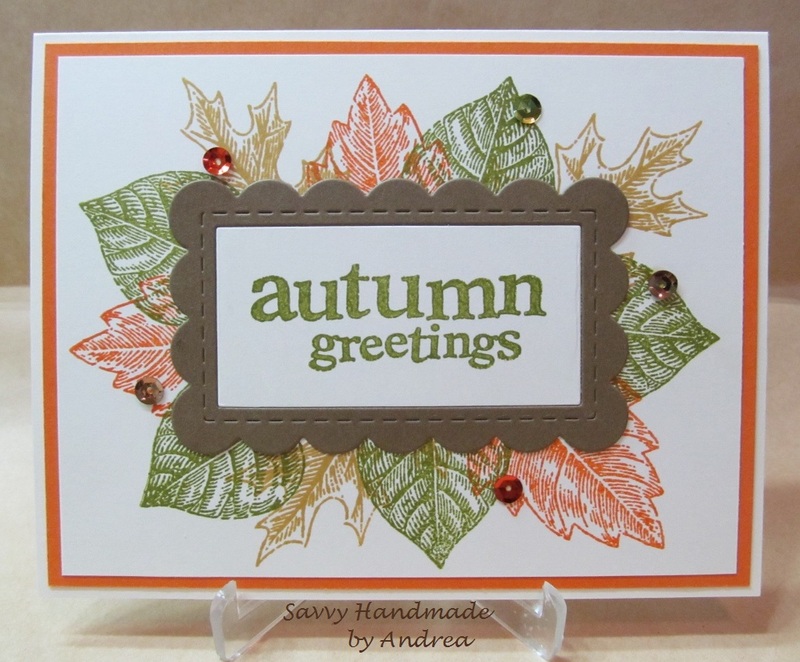 This Framed Autumn Greetings Card was fun and easy to make. I liked stamping multiples of the leaves to make a leaf wreath to accent the scalloped frame. The leaves are from the Vintage Leaves stamp set by Stampin' Up! and the colors include: Hello Honey, Old Olive and Pumpkin Pie. The Soft Suede scalloped frame was cut using the Frame in Frame cutting plate by Taylored Expressions and the Autumn Greetings sentiment is from Inkadinkado. For a little sparkle five sequins in matching colors were used and that's it! Amazing card! Love autumn. The leaves and colors fit so well! This is gorgeous, Andrea! I love those detailed leaves! Beautiful fall colours! Love the way the leaves highlight the frame & sentiment! Thanks for playing along with us at CASology this week, Andrea! Such a lovely way to frame a sentiment! Beautiful, subtle colour scheme too! Lovely to have you join us at CASology this week! Lovely card, Andrea! I have got to get those stitched from Taylored Expressions! Beautiful card. Thanks for joining us at Watercooler Wednesday this week. So pretty, Andrea! I love the effect of the leaves peeping out behind the sentiment! Thanks for joining in at CRAFT Challenge!